I love Florence. It happens to be one of me and my husband’s favorite cities in Europe. There’s also something undeniably romantic and unique about a wedding taking place in Florence. 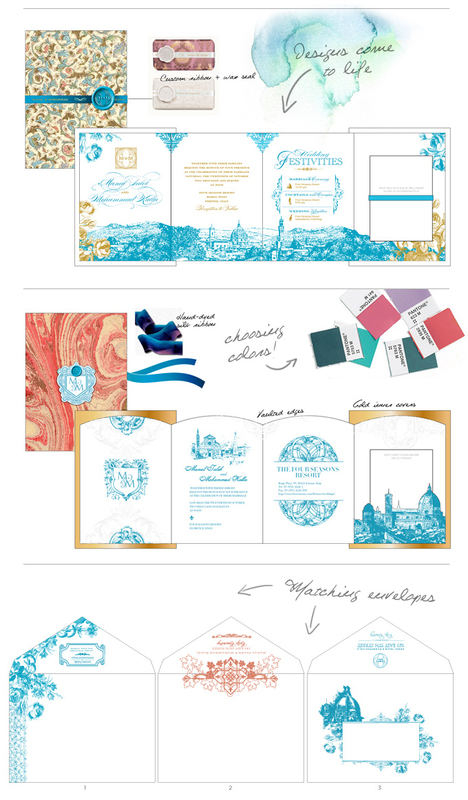 So when Manal and Mohammad, a stylish couple from the middle east came to us with their vision for wedding invitations that would embrace the personality and rich culture of Florence, we couldn’t wait to get started! I’ve written before about incorporating details from your destination into your wedding stationery and this gorgeous design did just that. From the sumptuous Florentine papers and iconic wax seals to the endless architectural and fine art inspiration, we had lots of fun bringing their vision to reality. So today I would like to share a behind the scenes peek into the process of creating their design (this one involved lots of sketching and research!). Part of the experience working with Atelier Isabey is our signature process where we thoroughly research and build stories and concepts for our couples to work with. That in turn can be used throughout their wedding stationery and even their wedding details and decor! 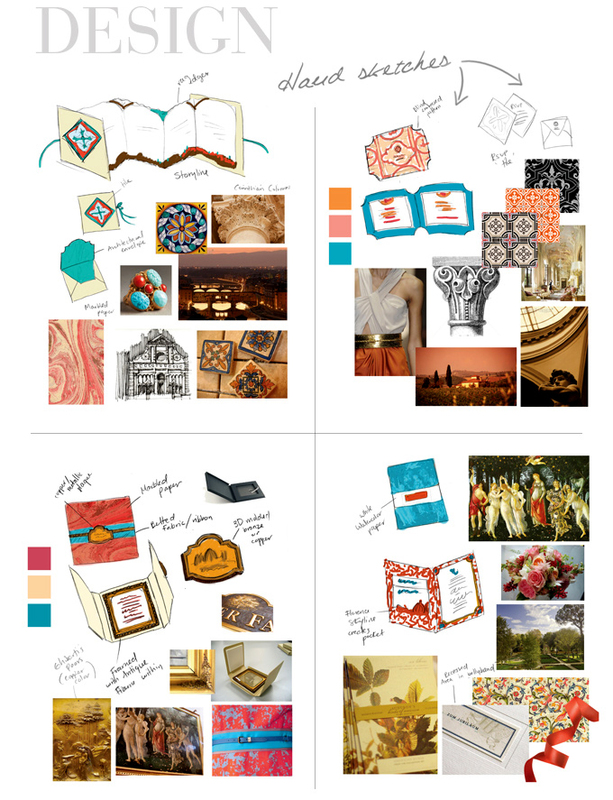 Take a look below at our journey creating the invitations of Manal and Mohammad. After all the inspiration and brainstorming different constructions, we decided on an accordion fold presentation. 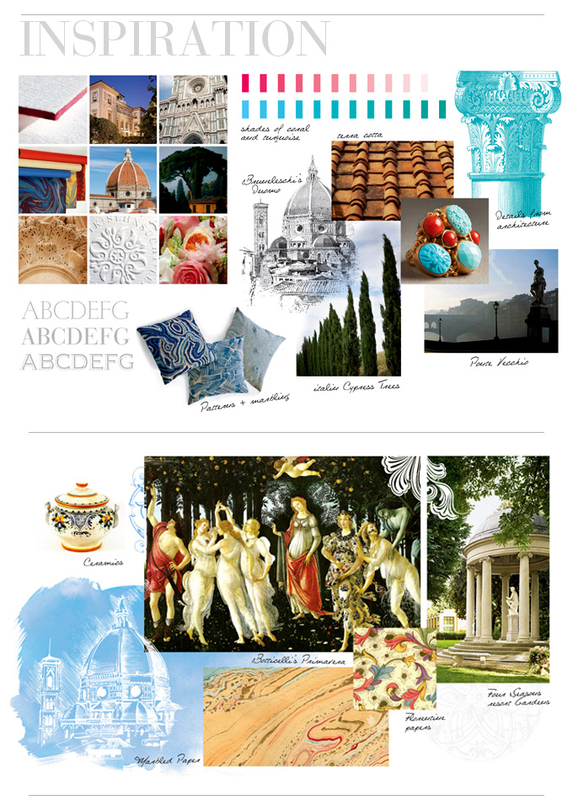 It was perfect to gain lots of real estate for the Bilingual wording they had requested as well as highlight a sprawling panorama of Florence. Can you spot the Duomo? And finally, the printed piece! I love all the little details throughout. We had the paper specially hand marbled for the couple which was then mounted to the front and back panel of the accordion. This was also our first time doing an invitation with calligraphy written Arabic, which was made to mirror it’s English counterpart. The result certainly gave the guests an inclination as to what was to come in this beautiful wedding. Do you think we captured the heart and spirit of Florence? Click here To see more pictures of Manal and Mohammad’s invitation suite.